This page details how to manage the way blocks appear on your page. Blocks can be minimized, maximized, docked, and undocked. Below are examples of each using the Administration block as an example. 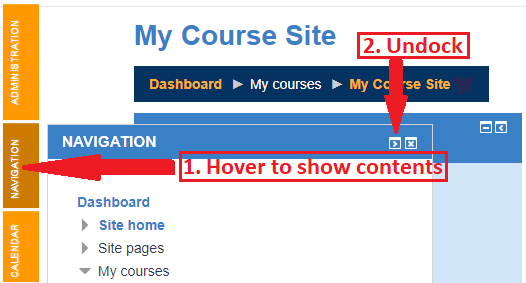 Note that these settings apply for your individual account, and not for an entire course. The default setting for a block shows all of its options. To minimize a block so that only the title shows, click the - button in the upper-right corner of the block. If the block is minimized, click the + button in the upper-right corner of the block so that the whole block will be displayed. To dock a block, click the < button in the upper-right corner of the block so that the block will disappear from the column and be displayed as an orange heading on the side. To undock a block, hover over the docked block so that the block appears. Click the > button in the upper-right corner of the block. To undock all blocks, scroll down and click the orange > button in the lower-left corner of the screen.